The simple onion bahji has held me captivated for years, it’s simplicity knocks me to the floor and in my opinion it is the ultimate in street food! This is what simple food is all about….turn a boring old onion into something that takes your breath away again and again! 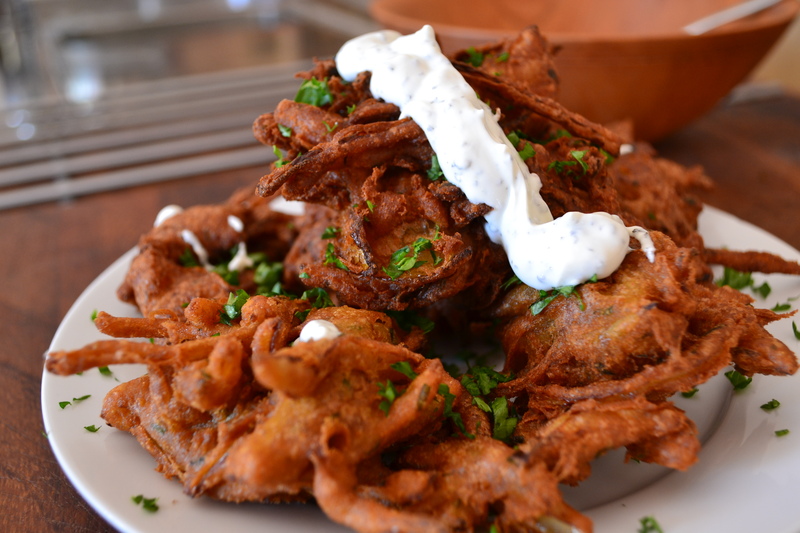 Compliment what ever curry you are making with this insanely excellent Beer Battered Bahji!! So this couldn’t really get easier – you gonna make a straight up beer battered flavour by Gram flour, Curry powder and coriander – that’s it! Kick off by rinsing the onions under running cold water – this will soften the real onion kick. But, this is entirely optional so if you like a good onion belt then forget this step! Kick off by making you batter – mix all of the ingredients except the onion together in a large bowl. You are looking for a thick batter the consistency of double cream. Next dump in the onions and combine well. To cook the bahjis get a deep fryer on or a deep wok with simple veg oil – bring up to about 190c. Grab a small handful of the bahji mix – this will be messy so keep a cloth handy. Then very gently ease the mix into the hot oil, it will start to cook immediately. The bahjis will only need about 30 seconds on each side – so fry in batches and keep them warm in a low oven. Serve the bahjis with a fresh mint yogurt and you are in bahji heaven!! lovely.. you cannot beat a bit of argey bhaji! …even badder with a Belgian beer at +12%! !